Ubisoft has dropped the next installment in the Assassin’s Creed Odyssey story expansion, titled Legacy of the First Blade: Shadow Heritage. 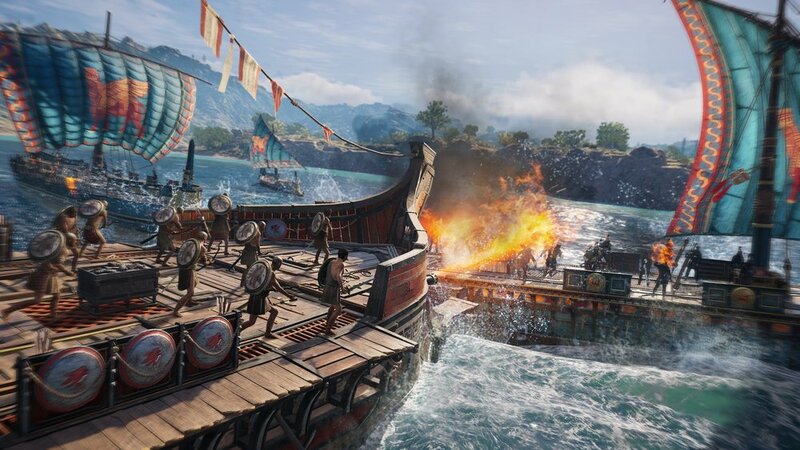 This episode, the second out of three total, takes place shortly after the first; we’re back to encountering Darius and his son (or daughter, depending on who you’re playing as) as they attempt to take to the seas and escape Greece forever. Unfortunately, another threat stands in their way: The Tempest. As much a person as a violent storm, the Tempest is yet another tool of the Order of the Ancients, hell-bent on finding Darius and his ilk. One of the first things I noticed in this episode was that Ubisoft takes a few laughs at itself, and at the Creed universe at large; for example, an early mission has a citizen yelling at you for being on their roof, lamenting that people are always jumping off of it… and that he’d better put more hay at the bottom. Considering we’ve been jumping from unscientifically-safe heights into hay since 2008, I got a good chuckle out of this. And then I, too, jumped off the dude’s roof. The story centers in Achaia, where throngs of people have been stranded thanks to the Tempest’s fleet taking over every bit of sea nearby. Kassandra, Darius and Natakas (or Neema) team up once more to take down the hierarchy of this new Order branch, opening the waterways and allowing these poor, unfortunate souls to venture home. Throughout the tale, you notice that much like the original story, this one’s distinctly centered around family. A mother and her lost daughter. A father and his child, constantly running. And a misthios, alone in the great Greek world. Y’ALL SHOULD KNOW BY NOW: THERE’S GONNA BE SPOILERS AHEAD! It’s a child. The legacy is a child. Now this storytelling choice has stirred up some dust; throughout Odyssey, you had full control over your character’s sexuality (or lack thereof), a fact of pride for Ubisoft. However, when lesbian Kassandras and gay Alexios were suddenly consummating a hetero relationship, well, you can see where the disconnect would be. Ubi reported that they “missed the mark” on the delivery of this; there are two options, one indicating that you love Natakas/Neema and that’s why you did it, and the other is straight-up telling them you just wanted to keep your bloodline going. People felt that the paths weren’t distinct enough, and for that, Ubisoft was sorry. They did explain that ultimately, the characters knew that both bloodlines needed to continue on, and much like Kassandra’s mother and others of the Tainted Ones, it was a duty to be done. My Kassandra loved everybody, so I took one for the Tainted Ones team. It’s still a beautiful moment though, and I’m quite curious to rifle through some Assassin’s Creed history and see if I find that baby’s name written somewhere… or if it hasn’t yet, if it will. The story wraps up with a man watching the heartwarming scene from a distance, smiling… and telling his armed guard to send every Persian soldier and ship to this location. It looks like we’re in for one hell of a finale. Mechanics-wise, it’s still almost as pretty at the rest of the game. For some reason, I seemed to have rendering issues with this Episode, like that final layer of details either took forever to load, or just didn’t load at all. This is not something I experienced previously, and I seriously hope it doesn’t continue into future DLC. The episode adds a new ability, some equipment, mercenaries and an entirely new branch of the Order to hunt, though thankfully, these cultists aren’t as obnoxious to track down as some of their predecessors. One gripe I had with Shadow Heritage, story-wise, was a few (small) gaps in the storytelling itself. One such gap was that an engineer, helmed with creating a flamethrowing weapon for the bow of a ship, coded his instructions in such a way that no one else could read them. Of course, right after he tells me this (and that he’ll install them on MY ship, instead of The Tempest’s), he gets merc’d. Why do we ever talk in open areas? It was an amphitheatre! Considering I was standing on my ship when they were instantly installed, this was a surprise. Despite this, the story itself isn’t lacking. Unlike Episode 1: Hunted, we are more invested in the people experiencing the tale than the history and lore it presents. And while I don’t think it’s quite as good as Hunted, it still weaves a good story-- one begging for an explosive finish. PS: Phobos is still the worst horse, possibly ever in video game history. Jeez.